I have a long and close association with Kumaon. I first visited this part of the Himalayas when I was a schoolboy at St.Michael’s, Patna. We came to Corbett National Park on a scout camp in 1975. The romance of Jim Corbett’s life was fresh in my mind, having just read The Man-Eaters of Kumaon. This was boyhood, and life before the wild-life laws came into effect was uncomplicated. 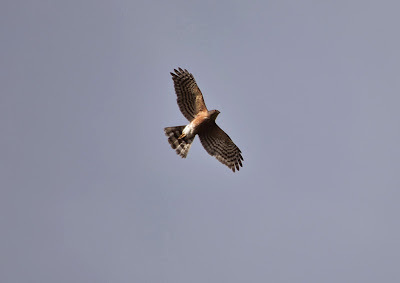 So I would often accompany my Uncle on his shikaar trips to the jungles of Rohtas on the Western edge of the Chhotanagpur plateau in Bihar, occasionally toying around with his rifles or pistols to shoot down a quail or a partridge (one reason these birds have virtually vanished from that part of India). I can still recall the occasions when one would hear the roar of the tiger from the machaan in the dead of night, waiting expectantly for him/her to approach the kill. 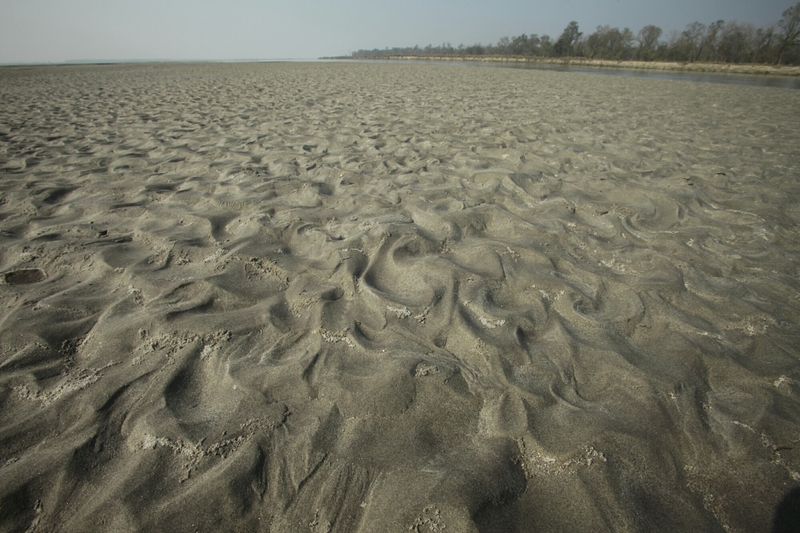 Standing out in the memory of that 1975 trip to Corbett are the swim in the choppy Ramganga (there were crocodiles we were told!) and the time we found the tiger’s pug-marks very close to our tents. I visited Corbett again with my parents and my brother in 1979. On that occasion we were chased by a herd of elephants (could they run!) who did not much like the sound of the jeeps so close to some of the younger members of the herd. I also remember that trip for the occasions when we went rowing in the lake in Nainital and the magnificent view of the snows of Trishul, Nandaghunti (and was it Neelkanth?) from Ranikhet. Later in 1979 I took a challenging hike with some classmates from school up to Rupkund Lake at 15,000 feet, right below the Nandaghunti-Trishul peaks. I repeated the trek with other friends a few years later, when I was in college, and almost lost my life when I was thrown off a windy ridge on the last leg of the climb, amidst a blinding blizzard. I was bringing up the rear, and lost control in the gust at some point, very close to dusk. I must have fallen at least a few hundred feet, the rucksack still miraculously hitched to me. It was the soft, fresh snow that saved my life. I was so grateful to Providence when I realised that I survived with all my bones intact. It took me two hours to make my way up the slope again. It had become pitch dark by then. I made contact with my friends after a while, and there was much relief. That was 1981. In 1994-95, I spent many months in Kumaon, researching the forests of the region for my doctoral thesis. I studied the institutional changes in forest management since 1815, when the British seized control of the region, bringing the story right up to contemporary times. 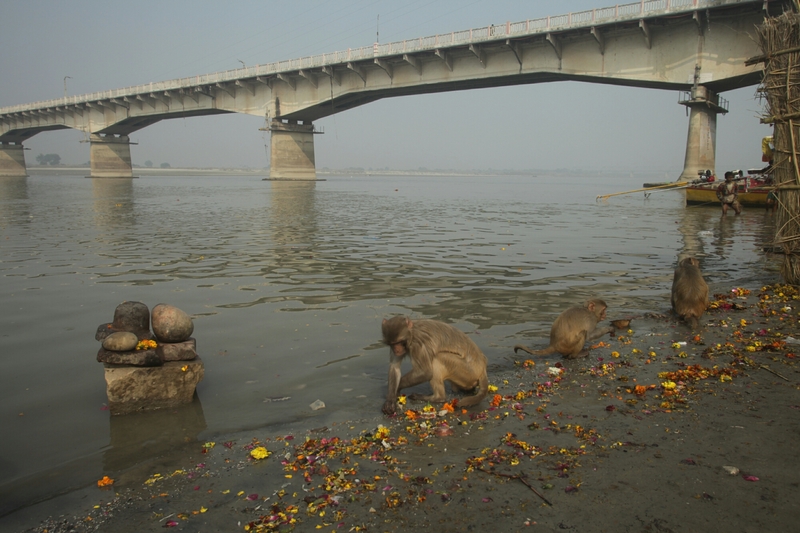 There was much to learn, not merely from the archives in London, Delhi, Lucknow, Dehra Dun and Nainital, but also from conversations with conservation stalwarts like Chandi Prasad Bhatt, Ramesh Pahadi, Ravi Chopra and Shekhar Pathak. It was in February 2007 that I finally had a chance to visit my friends Theo and Malika, who have made Munsiyari their home since 1992. I loved the place. Its beauty and simplicity was most appealing. So, when I got an opportunity to come here again this year, I seized it with both hands. I am far from Delhi, in the village of Sarmoli near Munsiyari, not more than 10 miles as the crow flies from the awe-inspiring high snows of the Panch-Chuli range in the Kumaon Himalayas of Uttarakhand. Neither Tibet, nor earthquake-ravaged Nepal are too far from here. 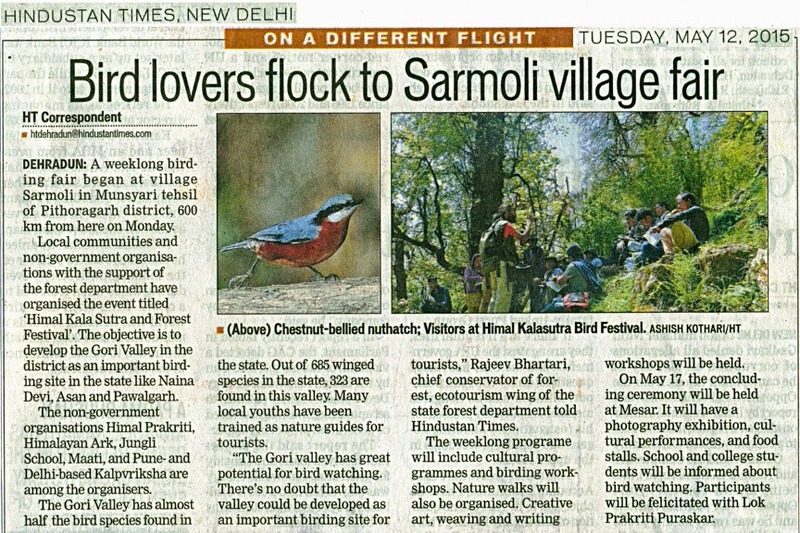 My co-author Ashish Kothari and I came here for the bird festival, Kalasutra, which just got over. Ashish has left, I have stayed on a few more days so as to meet Theo, who returned from a trek to Garhwal last evening, and to attend the big Mela that is scheduled for the 17th, all this a tribute to the organisational energy of Malika ('General Saab' as I like to call her, as opposed to Theo, who is just 'Saab') and her team of extraordinary workers at Himal Prakriti (http://www.himalprakriti.org) and Maati (http://www.sruti.org.in/?q=sangathan/maati-sangathan). They have been doing some outstanding work involving conservation, watershed restoration, livelihood generation (often through tourism), craft-revival and community-building over two decades. Malika was also elected as Sarpanch of the Van Panchayat of Sarmoli in 2003, though she has not held the post in the last few years. There are many other friends visiting here from various parts of the country, from as far away as Bengal, Bangalore and Kerala. Each is here to learn from and contribute to the creative community experiment that Sarmoli is becoming. At the heart of the action is little Sarayu, 4 years old, daughter of Sandy and Shruti, who are visiting from The Centre of Learning in Bangalore. She speaks with the authority of a grandmother, careful to lean on each syllable as she goes about constructing complicated sentences, ever keen to try the varieties of local food - from Sampa Sattu to Ragi bread to Kadhi-Tehri - that one or another person keeps churning out of the busy kitchen here. We take turns to cook, though Malika, Ram (Malika's right-hand man for the past two decades) and Shruti end up doing the bulk of the work. Sandy is helping local workers build the stone-embankment next to the homestead. The elderly Nainda (from a village nearby called Jainti) sits on the terrace doing a form of basket-weaving unique to this area, another craft which few young people are keen to learn in these parts. The Maati women are also here to do their weaving and embroidery work. Theo and Malika’s son, Zanskar lives here too. He is a skilled outdoor guide, after spending two years getting trained in New Zealand. Zanskar is a science fiction aficionado and may well turn out a novel sooner than later! The two dogs, Laddoo and Apalam - both beautiful, tough Tibetan Mastiffs, and the cat, the pregnant Tokey, complete the cast, not to forget the four cows, lots of hen and two geese as well. India has among the largest number of bird species in the world, up to 1300 according to surveys in recent years, at least 300 more than the United States (numbers change according to season, year and duration of surveys). Thanks to its enormous ecological diversity, India has easily the widest variety of birds in the world too. There are desert-birds, Himalayan birds, birds that breed in wetlands, birds that thrive in rainforests, on grasslands, cultivated fields, and human settlements. However, what is striking is that a quarter of all birds found in India live in a mere 0.7% of its geographical area, making such regions as the Himalayas especially critical from the perspective of conservation. 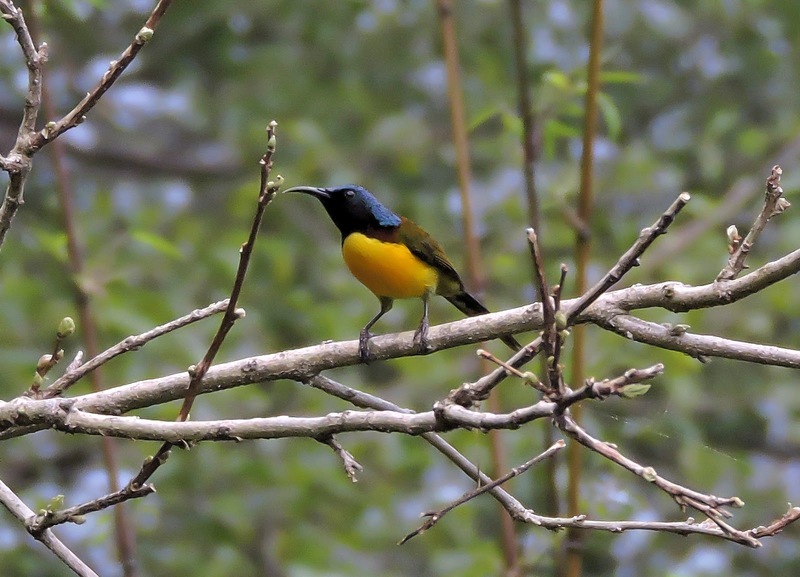 Of the 1300 bird species to be found in India, some 690 are to be found in the state of Uttarakhand alone (some of these are also found elsewhere). Of these, as many as 326 are found in Munsiyari! 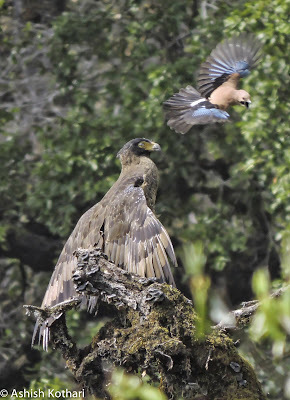 So Munsiyari is an area of intense interest for anyone interested in birds and their enormous significance for the health of ecosystems. A researcher from Princeton was here recently, exploring the possibility that the changing nesting habitats of birds (moving to higher altitudes, for instance) may be prompted by climate change. It may be relevant to remember here that one important reason many jungle cats may have turned into Jim Corbett's famous "man-eaters of Kumaon" a hundred years ago has to do with the fact that they moved up mountain slopes in search of food (after game had begun to vanish in the terai areas, following intense deforestation for commercial purposes) and found mostly humans for food at higher altitudes! 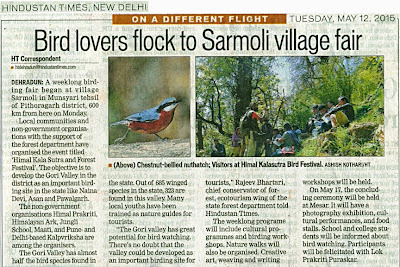 During the bird-festival, scores of school-children were here and they were taken around by local guides, trained by Ram and Theo, on bird-walks. 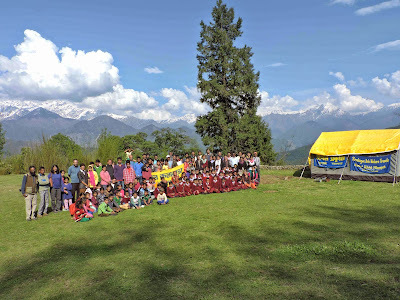 In addition, there were many other events and games organised for them, Zanskar handling the obstacle games and a variety of jungle rope-tricks. In 1997, Malika did a remarkable 210-day Himalayan traverse, walking with a team of nine women led by Bachendri Pal from Bomdila in Arunchal Pradesh to the Karakoram Pass in Kashmir. 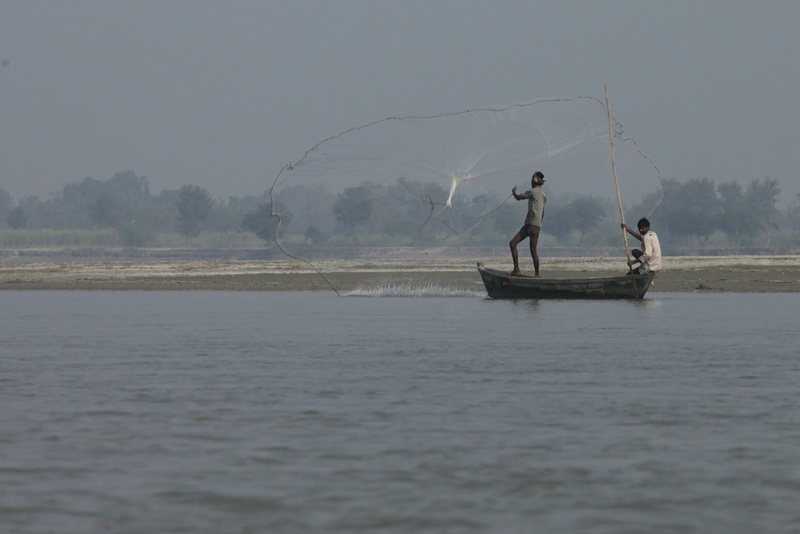 Almost two decades later, Malika’s husband and son took up the challenge of rowing down the Northern flank of the Ganga watershed as it emerges from the Himalayas in Eastern Uttarakhand. 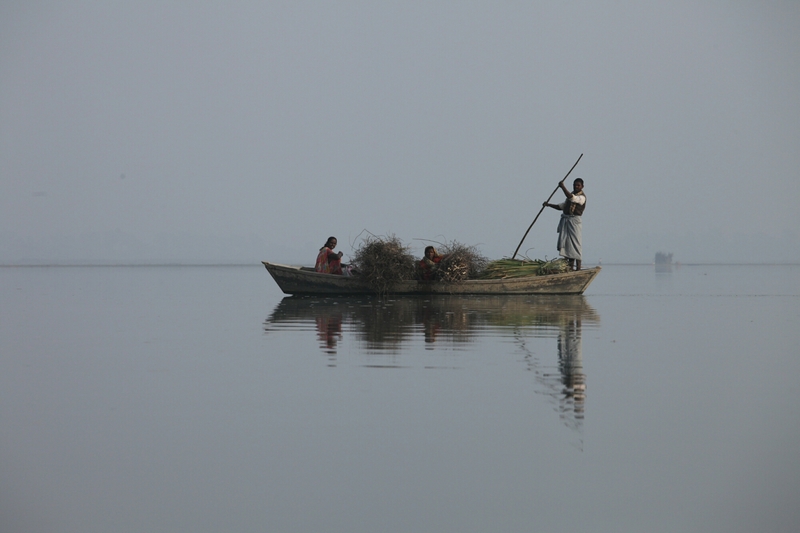 Theo and Zanskar rowed almost 2000 kilometres, for 75 days, from November 2014 to February 2015, along the Mahakali-Karnali-Ghaghra-Sarju-Ganga continuum, terminating their exploratory expedition in the delta of the Ganga in the Sundarbans. Malika joined them in the last leg of their voyage. Two beautiful village girls once went bathing in a mountain lake hidden by forests. One of them fell in love with a man who she met there and who took her up the mountain. The pandit at the temple spilled the beans to the villagers, who came up the slope looking for the missing girl. When they confronted the man who had taken the girl, wanting her back, the man told them that they could have her body back, though her spirit would remain with him. The villagers consented and had to face the dead body of the girl, who had been killed by the man. He appeared to them in the form of a wrathful god who cursed the village community that no more than one child would be born to each family. From that day onwards the villagers began offering a sacrificial goat at the mountain lake in order to appease the god. They began to commemorate the occasion with a mela. The lake is Mesar Kund, a few kilometres up the slope from where Malika, Theo, Zanskar and Ram live. They have helped the village community in restoring it. The village is Sarmoli and the community call themselves the Barpatiya. The mela to mark the occasion is called Mesar Kautik. Labels: Ecological Democracy, Ecology, Ecology and cognition, Environmental activism, Forests, Handlooms, Harit Swaraaj, Himalayan Ecology, Himalayas, Stories, Swaraaj.